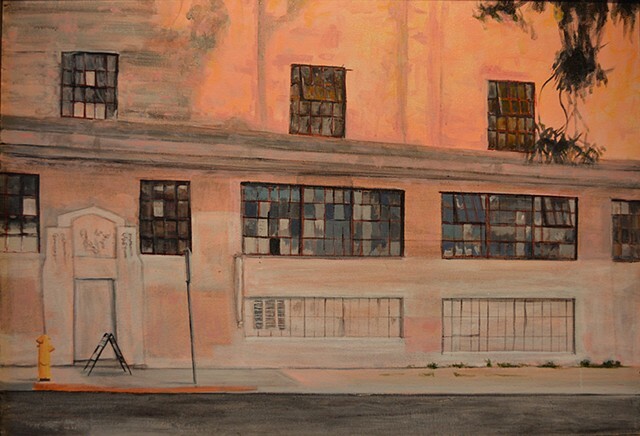 The building depicted in this painting is currently abandoned, but was previously the city schools’ book depository. The building is part of an affordable housing project, although it is currently abandoned and uninhabitable. What drew me to the building is the texture of the crumbling brick, and the patterns and colors in the large glass paned windows. This building is located in Barrio Logan, an area of San Diego that until recently was a working class Mexican neighborhood. The neighborhood also has many industrial and military buildings. Recently the neighborhood has become popular among middle class non-Mexican people. In 2014 the City Council proposed a Barrio Logan Community Plan Update, that would outline growth for the neighborhood, and sought to separate the residential, industrial, and military uses into zones (right now they are all mixed together which creates environmental problems, as well as aesthetic ones). The plan also addressed public transportation and park space. Unfortunately residents of San Diego voted down the plan when the ship building industry, Chamber of Commerce, and the Navy, launched an advertising campaign against the Community Plan Update. The advertising painted the Update as endangering the city's shipbuilding industry. Now, the future of Barrio Logan and its buildings, like this one, is uncertain.